National debate • Activists of all political stripes agree on the urgent need for reform. Leading candidate Stan Lockhart (above) speaks to delegates prior to their vote. 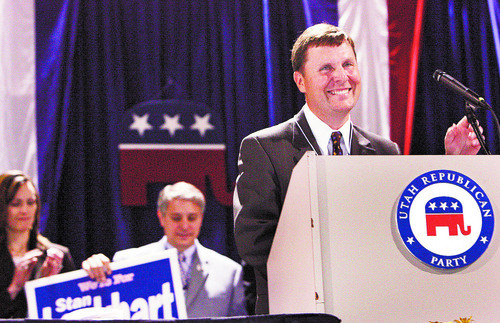 Utah Republicans gathered Saturday at the South Towne Expo Center to pick a new party chairman. Photo by Leah Hogsten/The Salt Lake Tribune | AP file photo Activists from Utah and elsewhere are descending on the U.S. Capitol Tuesday to pressure lawmakers to restart the national debate on immigration reform. Washington • They want immigration reform, and they want it now. Activists will descend Tuesday on the U.S. Capitol to pressure House Republicans to restart a national debate about visas, border security and paths to citizenship  and participants are far more eclectic than you might think. Mixed in with the Latino youths and the Catholic priests are people such as Stan Lockhart, a former chairman of the Utah Republican Party, who called reform "a moral issue." "Our country is a nation of immigrants," he said, "and we need to fix a broken system that is de facto amnesty." Lockhart is one of about a dozen Utahns participating in the "Americans for Reform fly in" organized by such groups as the U.S. Chamber of Commerce and FWD.us, a lobbying effort started by Facebook founder Mark Zuckerberg, along with Partnership for a New American Economy. In all, about 600 community leaders, many of them conservatives, will press House members to act  at least on incremental immigration reform. Other Utahns expected to participate include Todd Bingham with the Utah Manufacturers Association, former Utah Attorney General Mark Shurtleff and Jesus Loya of the Park City Angels, a group trying to make it easier for the children of undocumented immigrants to become citizens. The very existence of the fly-in shows that immigration reform is faltering in Congress. The Senate already passed a broad overhaul that would tighten border security, expand access to visas and provide a 13-year path to citizenship for those in the country illegally. The House panned that effort and has instead started work on a series of smaller pieces of legislation. A few of those, including a border-security bill, have cleared committee, but there appears little appetite among Republicans to move forward on the issue anytime soon. 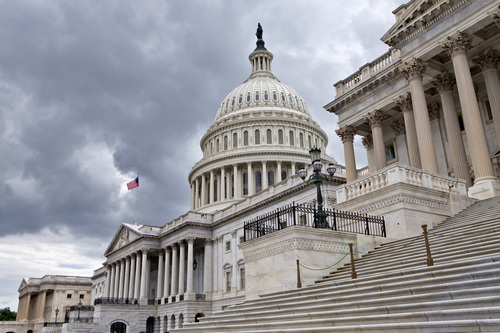 "It&apos;s disappointing," said Randy Parker, chief executive officer of the Utah Farm Bureau Federation, who is among those lobbying members of Congress this week. "This is an issue that shouldn&apos;t be shrouded in politics. It should be discussed out in the open." A deal breaker • Many Farm Bureau members rely on foreign labor to herd livestock, milk cows and harvest crops, and they say the inaction in Congress has resulted in fruit rotting in the fields. "Utah agriculture," Parker said, "really needs a stable policy that allows people to come in on work visas." There&apos;s wide bipartisan support for such a plan. The sticking point in this debate has long been what to do with those already here illegally. Parker said his members are not in favor of an "amnesty program," but at the same time he called the 13-year path to citizenship in the Senate bill "pretty strenuous." "Without doing something about it, we have amnesty right now," Parker said. "There is nothing being done. Let&apos;s get something done that makes sense, for heaven&apos;s sake." President Barack Obama has signaled a willingness to tackle the issue in chunks, like the House has proposed, as long as a citizenship path is included. That&apos;s a deal breaker for Reps. Jason Chaffetz and Chris Stewart. Chaffetz, R-Utah, called the Senate plan "amnesty" and something he couldn&apos;t support. "If something includes flat-out direct amnesty, I will vote against it," he said. "And that&apos;s a shame, because I&apos;m trying to fix this." He supports five bills that have passed committee. One reason they haven&apos;t come before the full House is a concern by some conservatives that if one passes, it could be used as a vehicle to move the Senate&apos;s broader reform. "It&apos;s a legitimate concern and against something the speaker and our Republican leadership need to clarify," said Chaffetz, a member of the House Judiciary Committee that oversees immigration issues. Stewart, Utah&apos;s freshman GOP House member, has said he will vote against any plan that would eventually offer an undocumented immigrant a chance to be a citizen with full voting rights. He believes they instead should gain legal status as long as they can pass a background check and pay a fine. Both Chaffetz and Stewart see an opportunity to pass a bipartisan bill if that citizenship issue is off the table. "I&apos;m optimistic," Stewart said. "There is enough bipartisan agreement here. I think we are going to move something." He expects that to happen in January at the earliest and it will start with a border-security bill and then may move to issues such as visa tracking and streamlining the process to get guest workers into the country. But for that to work, Democrats would have to relent on citizenship, an issue Lockart also believes is getting too much attention. The first step • "I don&apos;t think citizenship should be the defining part of this debate," he said. "Like a marathon, citizenship should be mile 26 and we are on mile one." He believes the first step should be a simplified visa program, which removes the sometimes-decades-long wait people must endure when they legally apply to enter the country. Lockhart is a lobbyist for Micron, a computer-chip manufacturer, and like most who work in the technology industry, he hopes Congress will also provide more visas for those who work in advanced math or engineering fields. But he said he accepted the invitation to participate in Tuesday&apos;s events to push the party&apos;s interest, not his company&apos;s.
Donna Milakovic, vice president of the Utah Valley Chamber of Commerce, will address the needs of the business community, which has largely stood behind the Senate plan. She&apos;s heard the skepticism about the chances for reform passing soon, and that concerns her because she believes immigration reform is needed to propel the slowing economy. "We felt like unless we come out and talk about what is happening, the support just isn&apos;t there. Nothing is going to happen and nothing is going to change," she said. "If we can help encourage our legislators to come up with those reasoned solutions, it will be well worth the trip." To move on such a complicated issue, particularly right after the bruising partisan battle over the first government shutdown in 17 years, would take serious compromise from each party. Democrats have shown a willingness to adopt GOP views on border security if it gets them a path to citizenship, but most of the Republicans don&apos;t appear ready to take that deal. Rep. Jeff Denham, R-Calif., is the only House Republican to co-sponsor a Democratic plan that combines the GOP&apos;s border-security ideas with the Senate&apos;s citizenship language. That bill has the support of 185 of the 200 House Democrats. Rep. Jim Matheson, D-Utah, is not one of them.